Talk to visitors at the door from home phone extensions using the DoorBell Fon Door Answering System (DP-28), made by Homephone. 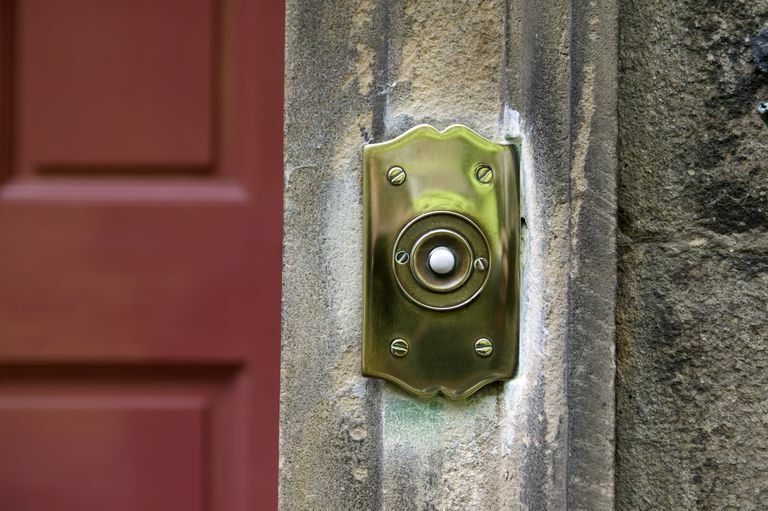 When the intercom button is pressed, the DoorBell Fon rings phone extensions in the house with a distinctive sound letting you know someone is at the door. Using a wireless handset, you can also receive notification someone is at the front door while you're working in the backyard. This avoids being tied to the house waiting for that important package to come or your visitor to arrive. Home automation technologies like these are designed to simplify your life. Plug your incoming phone line into the Doorbell Fon and the outgoing phone line to your home phones. Run one pair of wires to an intercom at the front door and if desired, a second pair of wires to an intercom at the back door. If you're uncomfortable with running the wires yourself you may want to consider hiring a professional home automation installer. Once the system is installed and the intercom button is pressed, phone extensions in the house will ring with a distinctive sound (a different ring for each of the front and back intercoms). Pick up any phone to connect to the intercom. If you have a limited number of phone extensions in your home, you may want to install additional home phone extensions to make answering the intercom more accessible. Using the Doorbell Fon Electric Lock Controller (DP-29SW), an outbound relay trigger, you can control an electric door strike (up to 1A 125 VAC or 2A 30 VDC) from a phone. Once you’ve answered the intercom and verified who is at the door, push the star key on your phone to let them in. Installation is simplified as the controller requires no additional power source and can be wired in series to the intercom. Using a gateway device like a Doorbell Fon Telephone Router (DP-28T), you can also forward your intercom calls to your cell phone when away from home. Then, using the Fon Electric Lock Controller, you can open your door or gate remotely. This is especially useful when needing to provide access to workers or cleaning crews. The Doorbell Fon phone answering device, lock controller, telephone router, and electric strike can be integrated into an overall system for controlling security gates.